1. Visitor Experience Ambassadors: Assist at the Reception Desk; greet and orient visitors. 2. Gallery Docents: Will be stationed at specific locations throughout the Museum galleries. 3. Docent (Tour Guides): Will provide overarching guided tours of the entire Museum's exhibits. 4. 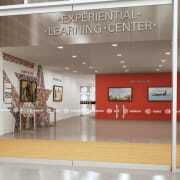 Experiential Learning Center: Will operate the ELC and Fort Discover alongside museum professional staff. 5. Departmental: May assist in various departments throughout the Museum, duties may include: Monitor telephone calls; research and draft answers to Requests for Information; assist with administrative duties/special projects. 6. Special Events: Will provide event support to the special events' team. 7. Outreach: Will enhance and assist the design and development of material to promote the Museum and Museum events/programs to identified communities of interest.